Don’t you just love wraps? I mean, talk about versatile – you can do just about anything with them and they are always totally fabulous, fresh, and fast! The perfect summertime meal, be it lunch, dinner or just a snack. Cook fish and set aside. Make salsa with the vegetables, olive oil, salt and pepper. 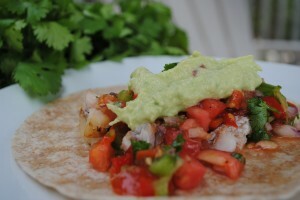 Assemble wraps with fish, topped with salsa and guacamole and other toppings like sour cream, cheese..etc. Enjoy! my 5 yr. old daughter request fish tacos. i’ve taken a few recipes and turned it into mine. i take tilapia patted dry and cut into pieces and put on a baking sheet. brush w/ a mixture of olive oil,cumin,garlic and bake at 450 for 6-7 minutes. awesome!good ole guac and salsa on them with a little cheese and for mom and dad some coleslaw mixed with chipotle mayo. can’t forget to make rice and beans to go with it! protein,protein!